This little truck, all grey, means that you have created the invoice but haven't yet "delivered" the product. Now, you might have given it to her in real life, but you haven't told the system that yet. So, it hasn't removed it from your inventory. This little truck, half blue, means that you have partially "delivered" the product. This is handy to know because there are times when someone may pay you for something you can't give her at the moment. You may either have to order it from the company or just pick it up to deliver to her later. Now lets look at some other information that you can find on your "invoices page"
First you see the word "Active." This is an invoice that hasn't been "archived." All invoices you see on this page are technically active. It is only marked as active if no other action has happened to it OR if you have completed it, then reverted it to draft. This is an invoice that things are happening with. Next, you see the word "Draft" as a status. This invoice has been saved, but not completed. When you see "Paid" as a status, you know that the customer has paid in full and that you have recorded that payment into Pink Office. Keep in mind that all these invoices are active, because they aren't archived. Active invoices can have other statuses as well, these other statuses just to give you more detailed information. The status is essentially the last action that was made on the invoice. Now let's take a look at the payment information. 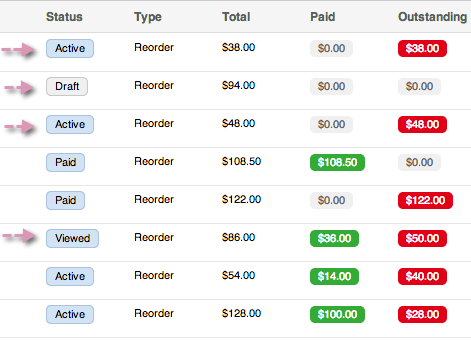 Example 4 shows an invoice that is still in the "draft" status. It is not complete so no money is owed and none has been paid. Now let's take a look at the "Actions" button. Click the Actions button and a drop down menu will appear. This is for invoices that are no longer in the "Draft" status. From this menu you can make a few quick choices about what you'd like to do with this invoice. "View" allows you to quickly view the invoice. "PDF" provides you with a PDF version of the invoice. "Add Payment" takes you to the page that allows you to record a payment for this invoice. "Email Reminder" can be sent after payment for the invoice has been requested. "Email Invoice" give the opportunity to send your customer the invoice. "Archive" saves the invoice under the category "Archived" so that it doesn't appear alongside the "Active" invoices. Just like you wouldn't leave paper invoices piled on your desk archiving invoices keeps the information handy, but keeps your screen clear of clutter.